ST. GEORGE – The National Weather Service has issued a wind advisory for west central and southwest Utah in effect Monday from 10 a.m.-4 p.m. 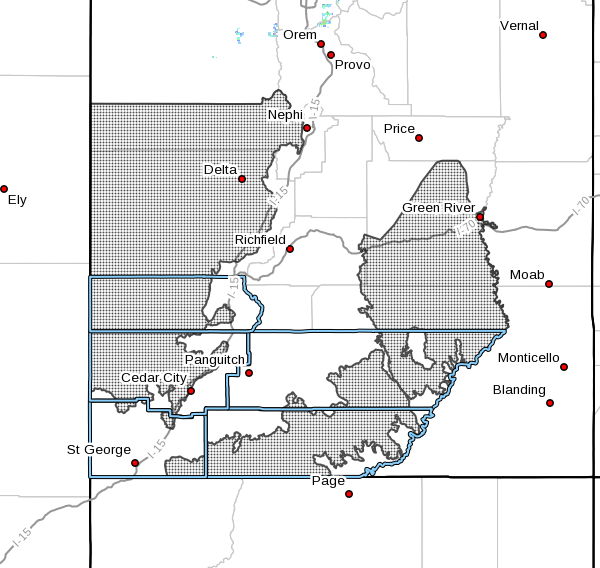 The advisory is in effect for west central, southwest and south central Utah, including the cities of Green River, Hanksville, Delta, Fillmore, Beaver, Cedar City, Milford, Kanab and Escalante. Southwest winds 25-35 mph with gusts to 50 mph will develop mid morning ahead of a cold front, later switching to the northwest. This boundary is expected to cross west central Utah mid to late afternoon, reaching the Lake Powell area around sunset. A significant shift in winds is expected with this front. Motorists in the advisory area should be prepared for sudden gusty crosswinds which can make driving difficult.